INDIRA DEVI, born to wealth, luxury and culture and refined to her finger-tips, came, unaccountably, to be dogged by other-worldliness which gave her no peace till she met her ‘destined Guru’, as she puts it, in Sri Dilip Kumar Roy who advised her to accept Sri Aurobindo as her Guide in 1949. But she refused and the great Sage counselled Dilip Kumar to accept her and wrote that she was an aspirant of “advanced spiritual consciousness” whose “samadhi was of the savikalpa kind”, and nature highly psychic and receptive. After founding the Han Krishna Mandir Ashram at Poona under the aegis of her accepted Guru, she began, at his instance, to write about her experiences and evolution in Yoga to two American brother-aspirants, Richard Miller and Don Taxay, who had adopted India as their spiritual home. These letters form the first Part of the present volume. The second consists of letters written by Dilip Kumar and others about the happenings in Han Krishna Mandir and about the saints and sages and spiritual life in general. These have been edited finally by Dilip Kumar as a tribute to Indira Devi on her birthday this year 1964, with the one aim: to attest the last Rality, vivid and large as life, which answers all true aspiration with its boon of bhakti and adoration of Lord Krishna who “manifests His Love through Beauty to lead us to Bilss.”. 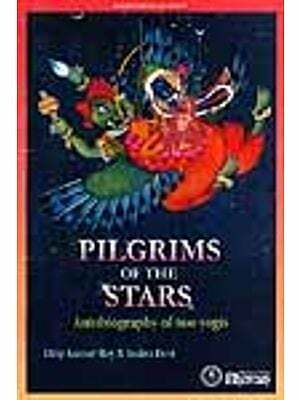 Translator’s apology: I was deeply impressed by His Holiness Sri Mahanam’s twin books on the Gita and Sri Gouranga. So I wrote to him. He complied with my request and sent me this Preface (in Bengali) to serve as a Foreword to Indira Devi’s Letters, translated into Bengali by myself and published in Calcutta last year. While gratefully acknowledging the debt, I asked His Holiness to translate his Foreword into English for the present edition. In reply he suggested I myself undertake the task. I have availed myself of his permission but with deep diffidence, as I am fully alive to the impossibility of doing justice to his inimitable style in an English translation, the more so as many of the images and similes which star his poetic prose can never retain their savour and ambiance in a language like English whose genius and temperament are very different from Bengali. So, I hope His Holiness will forgive me for having been forced to be somewhat free at places in my translation, as also for omitting a few passages I could not cope with. I have also taken the liberty of adding two quotations: one from Indira Dcvi’s 14th Letter and the other from Sri Aurobindo’s Savitri - at the tail-end. His Holiness has written in Bengali: “Manush pabe divyatanu”. But although it sounds perfect in our language, to translate it literally with “Man shall have a celestial body” would have sounded very much like an anticlimax in English, especially in a closing sentence. It has been said that an authentic God-seeker’s life dates from the moment he is initiated in Yoga, that is, when his soul is born spiritually. As I believe this, I will refrain from writing Indira Devi’s biography by way of preface even though she is the central figure in The Flute Calls Still. I have done my humble best to tell here how His Flute called her and, how again, after answering its call, she became a flute in His hands, as His Holiness Sri Mahanamavrata has put it so aptly. Still, many who have appealed to me to write about her life in the past are likely to be disappointed. I can only console them by stressing that I have portrayed, through others’ letters and mine, her spiritual evolution and stature in the second part of the volume entitled, Our Mandir. In its pages, however, I have tried to keep myself in the background, because I want all that I have penned or edited to be taken, by and large, as a history of and tribute to her rapid blossoming in the light of the spirit — a blossoming as incredible as it is indubitable - by which I wish to underline her astonishing Aspiration (referred to by Ruth St. Dennis, the famous dancer) which outpetalled with such breathtaking swiftness since her spiritual birth in 1949. “The greatest aspiration and joy of the little drop of rain is to lose itself in the river for it knows that only by losing it can gain. I feel tempted to go on for pages and pages, quoting her spontaneous reactions to the lore of Guruvad if only to show how they are all on fours with the findings of our forbears, but since that is not possible, I will conclude with a short account of what is perhaps the most remarkable and singular feature of her spiritual evolution, to wit, her relationship with Mirabai of hallowed fame, who has been singing to her moving songs on love divine day, after thrilling day, from the year of her initiation in Yoga: 1949. These lovely songs (which have already added up to more than 800 in number) she heard in her samadhi, a miracle, indeed, of the first water, hut what is a still greater miracle is that she remembered everytime the words and recited them verbatim! And, as this is, assuredly, the most abiding divine miracle I have witnessed in my life so far, I cannot, for fear of being scoffed at, fight shy of writing at some length about this breath-taking phenomenon. Were space at my disposal I could have easily written a hundred pages and still feel I have not said enough; but as that is neither feasible nor advisable, may I be permitted to quote my own Preface to a sheaf of her songs entitled, Pujanjali which was printed here in Pune three years ago in Sindhi script. Then she began to see, in her vision, a lovely lady in Rajput dress who sang to her beautiful devotional songs in a voice athrob with loves yearning and pain — viraha. 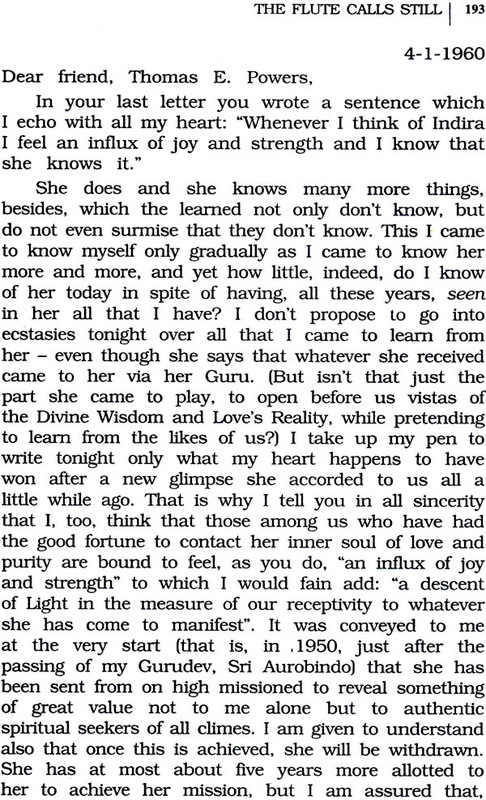 Once, at my request, she wrote about it all in a letter dated August 19, 1950, from Mussourie where she used to meditate daily from eight to ten hours. “I am writing this in the small hours of the morning after having just woken up from my meditation which lasted about five hours. “Mira came to me again. 0 Dada, how dear she has grown to me and how near! How real Her love and how close she is to my heart! And yet isn’t it all but incredible? To think that one so holy, who comes to me in my dreams and trances, should be growing as it were with my own growth! ... I am told that people simply will not believe me. I can only smile.Now that I have seen and loved Her, could it matter to me one jot or tittle, even if the whole world were to laugh at my experience ? A mere dream? But can a mere dream give one more lasting peace and sustenance of love than all the realities of the world put together? O Dada, I shall always be grateful to you, for it is because of your blessing, your meditation, that she came to me and loved me as she has. And how precious is Her Love! I wish you could see Her! She is lovely and her beauty grows on one. But I cannot make her out. I asked Her the other day: But tell me, are you really real? She placed herpalm on my head in token of blessing and smiled again and said: But do you know yourself, the real you ? I will tell you more about it all when you come next to Mussourie . But one thing I may tell you now as certain: that she will never forsake me even if the whole world does. Next followed a series of thrilling mystic experiences after which she began, lo, to remember the songs which, in her trances, she had heard Mira sing. As she started dictating these songs and I went on in delight, taking them down, I could no longer doubt their authenticity: the lady who continued to visit Indira I her Samadhi could be no other than the famous Mira Bai, Queen of Mevar, whose life – history had crystallized into a haloed legend centuries ago. While in Pondicherry, I first published in 1950, 165 of her songs entitled Shrutanjali meaning an offering of songs heard”. Thereafter, in 1953, Premanjali (with 95 songs) saw the light, to be succeeded, in 1958, by Sudhanjali with 183 songs, and lastly, in 1960, by Deepanjali with 167 songs, making up a sum total of 610 songs in all, of which about 600 were heard and dictated by her, a phenomenal feat in all conscience! And 200 more such songs remain still to be published. “Whenever he was in a state of ecstasy he would burst forth into song and one of the fellow-seekers, sitting by, would take them down.” These were later approved by the poet-mystic who said: ‘This is my nuska” (a physician’s prescription for the malady of life) (Divine Dwellers in the Desert pp. 47-48). To conclude with the comment of Sri Aurobindo (and who could be a greater authority on authentic mysticism ancient or modem?) He wrote to me three letters when I sent him a few of Indira’s songs with an elaborate’ account of how they were inspired and conveyed. 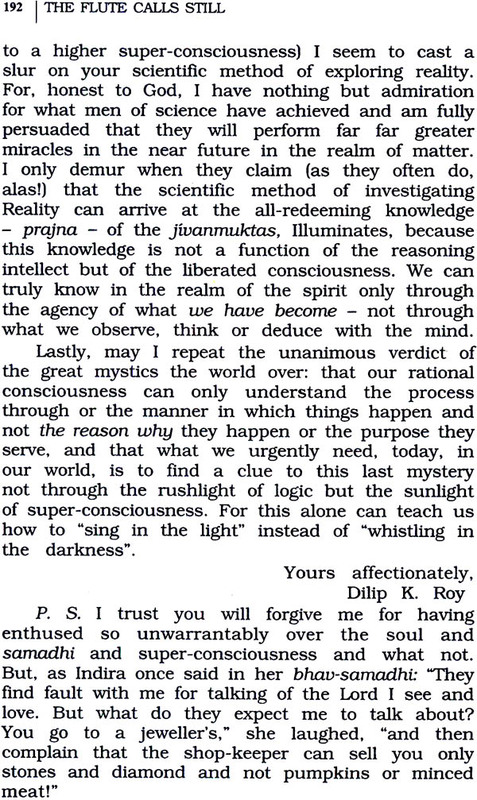 (7.5.1950) “It is evident,” he further explained in his second letter, “that Indira is receiving inspiration for her Hindi songs from the Mira of her vision and that her consciousness and the consciousness of Mira are collaborating on some plane superconscient to the ordinary human mind: an occult plane; also, this influence is not an illusion but a reality, otherwise the thing could not happen as it does in actual fact. Such things do happen on the occult plane, they are not new and unprecedented.”(2-6-1950). For the rest, I need only add that I am sure that these songs will go on inspiring — irrespective of caste and creed, race or religion — all true devotees and aspirants who need the light of Love Divine to help them tread the Path that leads to the Peak of soul’s fulfilment in this world of perfidious phantoms and false glimmers that end only in the Abyss. In the foreword we are told that this book — containing 167 Hindi bhajans and 33 English translations - is the fourth collection of Indira Devi’s devotional songs, which has been rightly compared with Mira’s songs. In these words the Yogi Anirvan has very correctly described Indira Devi’s songs and her complete dedication to Krishna. Mira used to consider herself an incarnation of Lalita a dear sakhi of Sri Radha who was the greatest devotee of Krishna. Therefore, it is not at all out of place that Indira Devi equally deeply in love with Krishna, should be considered by Shri Dilip Kumar Roy ‘in contact with Mira, singing’. In such rapturous moods, almost in trance, she dictates the songs with tears in her eyes, conveying the pure message of Mira’s world-oblivious love for Krishna. It is the purest devotion of an inspired soul and complete dedication that is manifested in the bhajans of Indira Devi: It is true that nobody can say whence arises this mystic longing, this overwhelming aspiration for self- surrender; but one can see it in Indira Devi and in her songs. Her whole personality is surcharged with love for love’s sake .... ahetuk prem .... which knows only love and wants nothing in reward, not even moksha — salvation. She considers human bodies or moulds as the pradips (clay lamps) and holds that we do not count till we make our lives into lamps to manifest the Lord’s Light. As I am bringing out The Flute Calls Still, by and large to pay the deep debt I owe to Indira Devi, but for whom Han Krishna Mandir, with the yugala-vigraha of Radha-Krishna, would never have come into being, any more than the vista of an undreamt of world of the Saint Mirabai’s personality, parables and inspiration would have opened before me (initiating for me a totally new phase of sadhana, blest by Radha, Krishna and Guru), I should like to add one word more before I conclude: namely, that now-a-days she not only recites Mira’s songs verbatim — for me to take down — but can, as often as not, reproduce also some of the beautiful and original tunes in which she has heard Mira sing them. A few of the tunes are quite new in style arid movement, so much so, that sometimes I have had to take them down in notation before I could sing them correctly. Someday, God willing, I hope to be able to publish some of these lovely airs to prove my contention — the airs that we sing almost daily in chorus in our temple — bhajans as well as namakirtans, and ever so many respond to them whole-heartedly. This I mention not only because it is a fresh miracle in itself (since Indira when she came to Pondicherry could not sing at all) but also because I look upon the achievement as a veritable landmark in the evolution of her many-mooded personality.